I don’t know about you but I tune into the world news every day and get a vast mix of positive and negative stories and opinions. I wake up and feel both as well. I expect that’s why Sage has THIS MESSAGE for us this Easter. “The imprint on your planet at this time of year is very dense. Your history of humankind has brought this energy back to the forefront again and again. So for thousands of years, the heaviness has increased. The feeling is palpable. And all the chocolate in the world does not dissipate the heavy tugging at the heart. It matters not what you think of the story of Easter. It matters not whether you acknowledge Easter or not. It is about the influence of energy that is thick and dense and palpable. It is not an energy that completes its cycle, as it sits heavy. Last year I asked the committed women in the Soul Group Membership if they had any questions for Sage. Now, as part of the membership, I bring through a channelled personal message for each member every month, but I was asking them for bigger questions, not personal ones. Explanation questions. Questions that YOU are likely to ask too. As Sage, we feel this question coming through because of the evolutionary changes which are rapidly occurring on your planet at this time. However, we wish to tell you that belief has always been of questioning by humans on your earth since the beginning. Consider that love is nourished by beauty, mystery, and pleasure. Beauty, mystery, and pleasure are impermanent. Illusive. Ever-changing. Yet, there is great security in knowing it’s all constantly changing. Now, that may sound like an oxymoron, but you can count on ever-changing as a constant, and never get bored or tired, which would cause you to switch from high consciousness to auto-pilot low consciousness. Within that constant, is a thrilling joy ride. But of course, it’s not for the faint of heart. Many people are starved for intimacy. They are starved for true intimacy. True connection. Not some movie version of romance and love, which looks good on the outside yet feels hollow on the inside. According to Sage, April gives us the ‘vantage position’ of hindsight. They explain more about it in this month’s channelled selection from ‘At This Time’. In previous messages we have asked you to look back at the month that was. Your brain has the capability of summary, of hindsight. To look back at your month of March now, and to assess it, to feel it, think it, analyze it, see it from different perspectives. You will see a range. You will see it went up and down. You will see your world, the world, every industry, community, family, had a range of highs and lows of experience and expression. Earlier this week I recorded a juicy chat I had with my favourite karmic astrologer, Marielle Croft. We talked about the cycle of retrogrades we had this past winter and WILL have this spring. We talked about their purpose and how we can best accept their gifts of influence. We also chatted about some interesting influences this June, August, and next January. So basically, we touched on the past, present, and future’s most celestial influences to make note of. As seen through the soulful eyes of a gifted astrologer, the spring sky reveals much promise and purpose. Astrology doesn’t tell you what WILL happen. Instead, the planets reveal the greatest influences affecting everyone. For those who are considering it, let me give you the top 3 Q&A’s I’ve been navigating this week about the program. Q: Can I take longer than 21 days to do the program? A: You can take as long as you want! The 21-days of content are yours to keep forever. In the first 3 days you will receive links to pages on my website. You will have 24 hours to download each link. After that, they are gone. You will receive your own personal content to your own email account in the remaining 18 days, so if you want to take longer to do the 21-Day Commitment, take it. If you want to repeat the 21-Day Commitment, you can repeat it. Ever want to hit the renew button? And spring is the BEST time to do just that. Which is why I want to offer you something that begins on the first day of spring AND can hit your refresh button the day you start. A number of springs ago I talked about a MasterCourse I was just starting to bring through called ‘Soul Seeds’. It was all about understanding your life’s purpose for being on the earth. Well, fast forward a few years and hundreds of people who took it later, and I’ve had the nudge (thank you, Sage) to repackage it and offer it as a 21-Day Commitment to realizing your life’s purpose. GO AHEAD AND READ OR LISTEN TO THE 5 1/2 MINUTE AUDIO OF THE FOLLOWING BLOG POST. YOUR CHOICE. Whether it’s the ‘crazy’ weather or the ‘crazy’ news, the feeling is that things are ramping up. Spring does that all over the earth. Here’s an excerpt from AT THIS TIME in the chapter entitled MARCH. Sage’s perspective. “At this time, the future society is very near. It may be difficult to grasp at this stage when you see the division and individuation of countries and nations and cultures and religions. But there is a future, and it is not far away because the tipping point for those who are connected to inter-dimensional reality and expansion is further influencing and overriding perceived truth, contrived truth, and historical truth. This tipping point is leading the planet toward universal truth, the undeniable truth of the power and connection and collective power of love. As Sage, we are in awe of the speed in which this movement is becoming a reality. Think of the universe as expanding outward and then inward. It expands out and then folds into itself. It is a constant cycle of expansion beyond your brain’s perception of the understanding of expansiveness. It is a constant outward inward folding, merging, floating, morphing energy that is the universe. As every planetary existence elevates to collective, the universe rejoices in an orgasmic celebration of its folding in of love and expansion and joy and merging. The universe makes love to itself and with all, in continuous and ongoing ecstasy and joy of knowing itself more and more through the collective expression of ‘the all’. The human experience of being on the planet is about knowing yourself through the projection of yourself onto others and how they respond. You will notice you are at your happiest, for example, when you are connected, you are understanding, you feel similar, you feel pleased for those unlike you, you feel the expansion of the learning journey of others, you feel joy and exuberance at the opportunity to learn and grow in this expansive field of love. Your gifts to expand love, to be love, to share love, to teach love, to learn love, are the gifts you brought in to this particular focus lifetime. You said ‘Yes!’. You said you were here to help journey the planet Earth to its next level of love. You agreed that the journey would be joyful and expansive and connected and collective. You can see there is much work to do to get the planet to this future love culture we see your planet creating, and yet we joyfully, willingly, tell you this work is no longer the work as it was in the past when it may have felt you were dragging people along. Now it is a gentle nudging as others come along faster and faster and faster than ever before. Go ahead and read or listen to the 12 minute audio of the following blog post. Your choice. It’s my son Connor’s birthday today. He tells me he’s forever 22. Works for me. I had a good long chat with him the other day. I was cleaning out even more of my books when he came through. I used to clean out my books every year with Connor, so it stands to reason he would be easier to come through when I take on this activity. I find I have to clean out my books less often nowadays because I’m committed to going nearly paperless - and that means there’s not a lot of accumulation. So I’m down to only a handful of books now. I’ve gone digital with my photographs, music, movies, taxes. It feels very free and light. Almost ethereal. Again, it makes sense. Most of the books I’ve accumulated over the last handful of years were in the studies of the history, psychology, and sociology of life after death. You know, the afterlife. Before I had the first-hand experiences I now have (thank you, Connor 2.0), those books added tremendous insight and value to an area of understanding that is steeped in superstition, myth, and fear. I picked up Julia Assante's ‘The Final Frontier’ for the last time the other day and flipped through it again. As some of you will recall, after I originally read her book, I immediately emailed her, then phoned, and together we chatted for hours. As a soul regression practitioner for many years, I used to guide clients through their past lifetimes and deaths in those lifetimes to help them understand the purpose of the life they just reviewed and to assess what they were bringing from them into their current life. I eagerly guided over 30,000 soul journeys in those decades, so moving beyond death is quite commonplace, quite comfortable for me. I like to think I don't have a fear of death because I not only worked with it as a transformational tool, but I'm surrounded by it in my own family. I know that makes me unique and therefore a leader in this field. Julia Assante and I had that in common. Julia believed the fear of death was running the world. I see evidence of that everywhere. She looked at how the fear of death was produced in our society, in the media, in the health and beauty industries, including pharmaceuticals and insurance, which are the industries that most directly impact us on a daily basis. Together they have 'pathologized' death. And there is also fear of death drummed into us through governmental institutions, education, the constant-growth economic policy, and the sciences. All these exploit the fear of death, usually for profit, by disseminating visions of an unsafe world, and the body as a time bomb. The result is that we live in relentless anxiety of imminent attack, whether by terrorists, war, disease, ageing, accidents, or natural disasters. We are taught that death is the number one enemy, and that life is always superior to death, no matter how devalued that life may be. Because of our fear-based orientation, we have lost all natural trust in a benign universe, in the wisdom of the soul, and in the body’s ability to heal itself. The few scientists who might want to research the survival issue, risk ridicule, loss of funding and their professional positions. Most scientists also ignore the mountain of evidence for survival that already exists, in part because the evidence so far has not met their standards for scientific proof of replicable, clinically controlled tests. There's that three-dimensional reality again. Julia claimed that if we lost our fear of death we would be in a position to truly grasp immortality. My point as well. Then everything changes. Our inner awareness of what is really important for the planet and all its residents, now and in the future, will resurface. Dying would no longer be the end, but a small turning point in the life of the eternal self. It doesn't get more sacred and profound than that. Studies show that people who have lost this fear have measurably increased mental, intellectual, and psychic capacities. They become more reflective, more spiritual, more altruistic, and more sensitive to nature and the environment. They also develop a hunger for greater knowledge. In equal balance, prejudice and a “them-versus-us” mentality give way to concern and compassion for others. The primary desire for success and material gain fades away, as does the need to compete. Instead, people who lose their fear of death feel a sharpened sense of personal life purpose that invariably involves service. Imagine a world populated by people like this everywhere! Everybody - even atheists - secretly talk to those in the afterlife to some degree or another. Yet at the same time, we are taught to disbelieve the validity of it. Why is it then that an average of 58% of people polled had spontaneous afterlife communication? That's not even counting common deathbed visitations, induced communication, communication through mediums, and with children. 75% never mention the experience because of fear of ridicule. These polls are representative of the general population, meaning more than half of the population is aware of having contact with those in the afterlife. Many more have it without realizing it. What those in the afterlife do and say almost always takes us by surprise anyway, which shows that they are independent of our thoughts. Wishful thinking does not save lives, but warnings from those who have passed on, do. Fantasy won’t instantly heal a person of post-traumatic stress disorder, but a visit from someone who has passed on, can. The fear of communication that has been passed down over the years is partly the result of the imprint of biblical injunction against necromancy, which was punished by stoning. The injunction arose not to protect the living from the dead, but because the dead were considered gods or divine spirits. The instant alleviation of grief is the number one (and most popular) reason to explain some of the benefits of afterlife communication, but I know that's just the tip of the iceberg. I know there is much, much more, and over the last few years, I’ve been exploring it. Knowing that relationships between the earth-bound and those in the afterlife continue to grow, transforms the way we live and the way we die. That's the big piece. Contact with those in the afterlife also brings us face-to-face with immortality, a life-changing event. Sure, we get messages of reassurances, encouragement, warnings, forgiveness, etc. but greater than that, communication with those in the afterlife helps us reset our values to build, and live in, a better world. As communication develops, we are able to tap into the greatest resource of knowledge imaginable about everything, including the nature of reality itself: Why are we here? What is our purpose? What happens next? So why should people even think about the afterlife? Knowing something real about the afterlife, rather than relying on what religions, traditions, and the media tell us, takes the fear out of living and dying, and replaces it with wonder. It makes dying immeasurably easier while opening the pathway for communication. Any knowledge of the afterlife we gain before we die eliminates confusion, suffering, and even hallucinations after death that are caused by false expectations and misconceptions. I see that on a daily basis as I transition clients from their past life experience through their death. You can't dispute the facts when they are right in front of you. Understanding the afterlife means understanding eternity. When we truly understand eternity, our day-to-day stresses seem impossibly small, and we let them go. The result is a more robust life, lived with courage and purpose. Read or listen to the following 7-minute blog post. You know your preferred choice. Do you long for love? Do you expect love from others? Do you want our own love story? What if I told you that the sooner you understand the energy of love, the sooner you could align with it? What if I told you that with all your expectations, you could literally create happiness when you expand to this evolving love? Sage calls this love 20/20 LOVE. When you awaken 20/20 LOVE, you can bypass all the patterns you keep getting caught up in. And by aligning with 20/20 LOVE, you can experience love every single day. You can live 20/20 LOVE and your world will never be the same. Not only is the focus of the world on love, but it's ready for the energetic uplevelling of love. I see the need for it every day, don’t you? That's where '20/20 LOVE: It's Time To Activate The Next Level of Loving' comes in. 20/20 LOVE is brimming with the next evolutionary turn of love because love isn't static. Love is dynamic. And this love is being created as you live and learn and evolve. “This is how we would describe the energetics, at this time. For as you watch your own world, as you observe all that is going on within your observations of planet, of humanity, of animal and plant life and so forth, you would be the first to see that there is a next level of love that is being created at this time. Love is a dynamic, as we have said in previous messaging. It is the stuff of life. The glue that keeps it all together. Love is source energy. Love is expansive energetics. If you could imagine the room bursting with light, if you could imagine your heart bursting with joy, the biggest beaming you could feel or imagine, that is love. It is the next level of love. Now, you are practical human beings within the demographic you represent. You wish to understand how love is different for you, what this means to your relationships, what types of love we are referring to. What does the future look like? What is love? And so we have created this focus theme of course in your month of love because it is time you understood, and could then activate, even more of this next level love. This full spectrum love. We tell you the future of love has arrived. You have created a new understanding of love. And so we will take you back throughout your history as human beings on your planet. We will give you the broad brushstrokes of the formings of love, what love was expected to be, what love was assumed to be. We must remind you of romantic love, lust, love beyond being an emotional, love being a drive. We must remind you of marriage, arrangements, contracts. There is much that we wish to share with you that went on in previous centuries of your time. And then we will introduce the 21st century love. This is the love you are in the midst of creating as you are entering the Soul Age. It is not based on a singular form of love. It is, of course, based on the integration of previous forms to create something magical, mindful, meaningful. We remind you that on your planet there is much integration of thought, integration of formings. You see that what was separate is now coming together and joining together and forming together, so you have multi-relational beings. You have recognition that it is not black or white. It is not male or female. There is a great coming together that is occurring on your planet. An acceptance that love permeates through the polarities. Who are the 3 People Who Have Had the Biggest Impact on Your Life? Have a listen or read the 4-minute blog post. Who are the 3 people who have had the biggest impact on your life? The 3 people who have had the biggest influence? Not the most positive impact and influence either. In fact, that's not the intent of the question. If you looked for positive only, you would only be choosing from a selection of those people who have made an impact on you. A list of positive influences only would likely base its choice on who those three people 'should be', perhaps because of their significant roles in your life. But I'm not asking that. Who has had the biggest impact on your life - so far? Who shaped you, whether you wanted them to or not? Who do you still hear in your head? Who has coloured your world? I asked myself the question and without hesitating, I knew the three people in my life who have influenced me the most, who’ve had the biggest impact on my life, were, Janice, Connor, and Cheryl. Janice was a larger-than-life character. She also happened to be my mother in this life. She pushed me to become who I am today. It wasn't pretty, but it was a gift. Janice is still in my head every day. I hear her human pushing and influence. I also hear her soulful encouragements. Quite the colour. Connor happened to be my son in this life, but again, that role isn't why he had the most impact on my life. His colour of impact was the opposite of Janice's, but the gifts were the same. And unlike Janice, his soul self is seamlessly integrated with his human representative. Cheryl came into my life in the role of a client but changed my life forever when we ignited our soul promise and brought through Sage. Over the years, the human and soul bond solidified. I can think of it no other phrase but soul sister to describe the continued impact she has on my life. Now it's your turn. Take a few minutes. Write who, and why. Tuck your list away. Reread it a year or so from now. See if it rings true as time goes by. It’s February. It’s Ground Hog Day - a day to remember you’re evolving. ;) So we have a message from Sage. Have a listen to the 8-minute version as it was channelled in meditation form or read the transcript below. 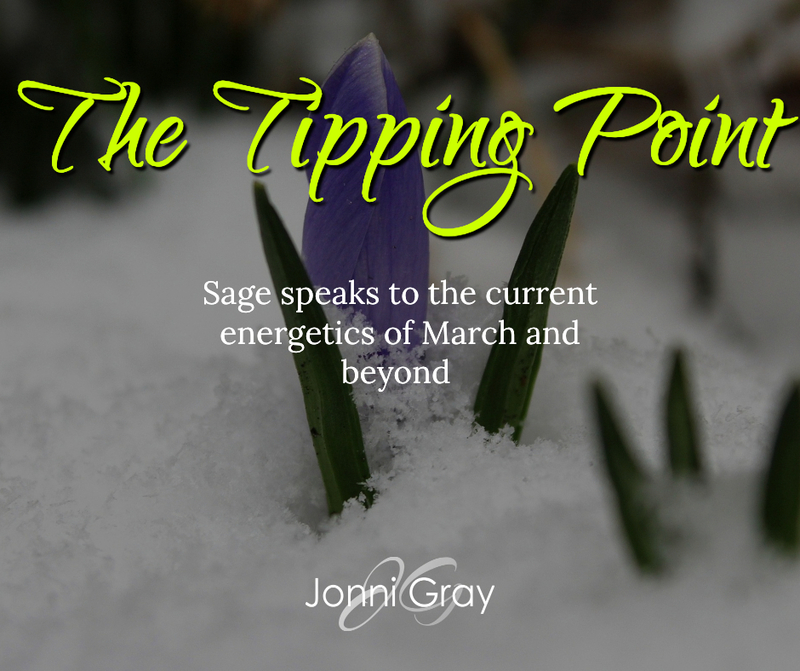 “As Sage, we have gifts to help you align with the energetics, to align with where you are, to show you how everything aligns in its potentiality, in its opportunity. When it does not feel in alignment, we ask you to step back and see what is occurring, see the patterns which are repeating, see the over or under creation of your masculine or feminine drive, see your expectations and your assumptions. You have heard many speaking of the earthly changes and movements. This is not a new topic of discussion, however, at this time it is referred to as climate change, global warming, and such. As Sage, we are reminding you that as your earth changes, it is because you are changing. The current energetics at this time are of a unique opportunity, a fork in the road if you will, between shifty energy and shifting energy. You may see those or even yourself who are shifty, who are keeping out of eye level, eye view, who are behind closed doors, who are attempting to go and be unnoticed and unseen. And those who are shifting, who are exposing, who are becoming more transparent, who are vulnerable, who are speaking of all that they are and moving forward with the understanding that they are aligning more and more and more. And so your earth’s shifting is occurring. The pattern is not as clear as one would assume from previous centuries and decades, but rather, it is shifting in temperatures and weather and earthly challenges and opportunities and so forth. This would indicate, of course, that the times of change are occurring. We have spoken of evolution rather than revolution. We have spoken of you, evolving. That you are here during the evolutionary times. It may not feel as though you are doing a lot, and some days it may feel you have done very little. You may look back over 5 years and believe you have not accomplished much. Yet we tell you to look back over 10 years, 15 years, and more, to see that you are evolving. As you are evolving, you are like the planetary changes which are now occurring, so there is disruption, there is contrast, there is polarity, there is all manner of uncomfortableness, messiness, and so forth. Do not be afraid. Rather, you must embrace. “Do not be afraid for nothing will happen”, does not mean “You will be safe and protected from harm”, but rather, “Do not be afraid of the changes for that is why you incarnated on the earth at this time in your demographic”. You are the accumulation of all and so you represent the all. You do not represent only one side which would be fear, or only one side which would be pure integrity and progressive. You represent the range that you are, that humanity is, that your earth is, in its densest form.